Thursday 19th October was set-up as a day of expectation. 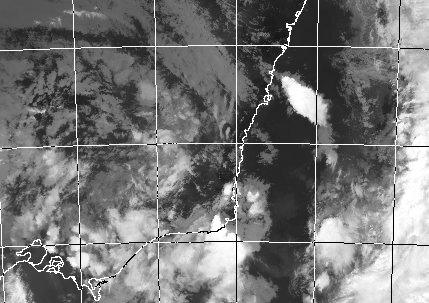 There was plenty of moisture associated with a NW cloud band wrapping around a low pressure system in Victoria, which was to produce severe storms and tornadoes in that area. 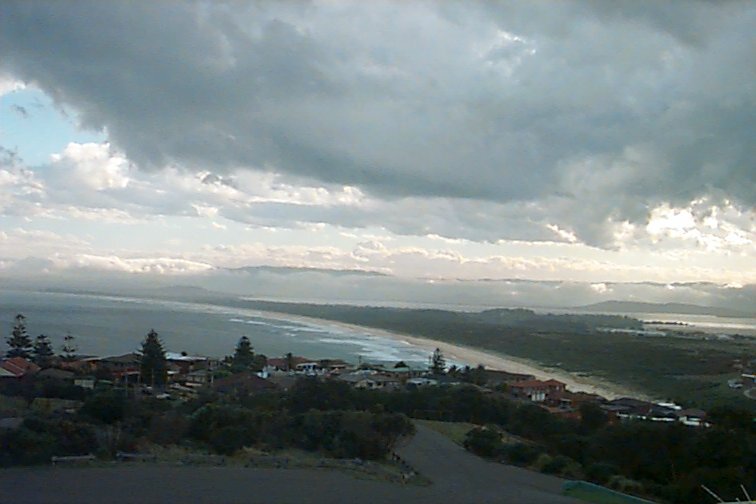 For the NSW coast, the result had been showers overnight around Wollongong, which cleared to mostly sunny and humid conditions around 11:00am. There was also a moderate to strong NNE airflow from early in the morning, which was feeding moisture into the Southern Highlands area. For mind, conditions were similar to the 1st August 2000, where severe storms formed just to the west of the Illawarra escarpment and produced large quantities of hail and a spectacular lightning show. This time, the winds were very strong from the NNE, with cumulus blowing off the escarpment but breaking up before it crossed the coast. 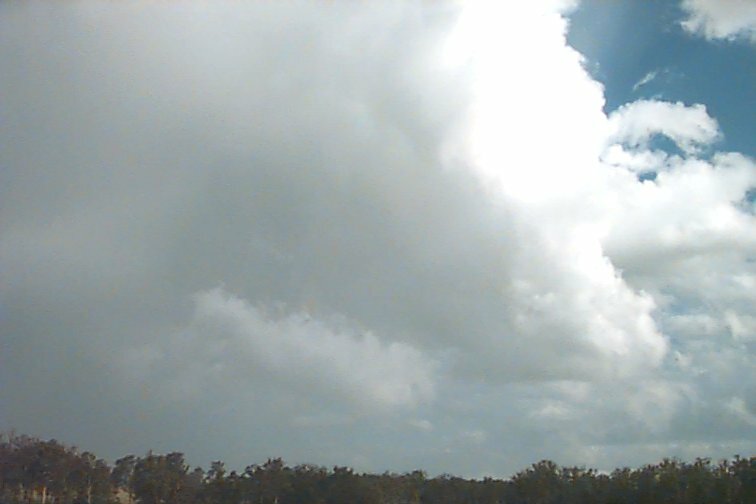 Around 2:30pm I noticed some building occurring to the SW, around and to the NW of Robertson. It didn't appear to be doing much, but with LI's of -6 and a high cape forecast for the coast, it built rapidly between then and 3:30pm. As I prepared to ride home from work the southern sky was very dark, with anvil evident and some cumulus towers building on the northern flank of the storm. The scene did not show to my inexperienced eye the truth of what was going on. After arriving home at 4:10pm and checking the radar, I was surprised to see areas of pink and red had been over areas between Shellharbour and Kiama not long earlier. The activity was slipping to the SE, but there was fresh development over the escarpment again. Within 20 minutes I had traveled south, marvelling at the scene in front of me. In a space between cells I could see scud being lifted from less than 100m into the rear flank of the main activity near Shellharbour. The image shows scud inflow being lifted into the rear of the storm from the low ranges around Oak Flats. 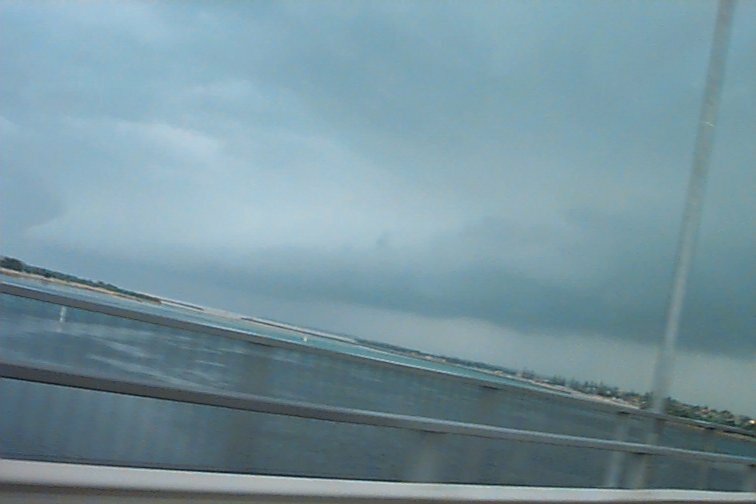 This inflow was from the SW. 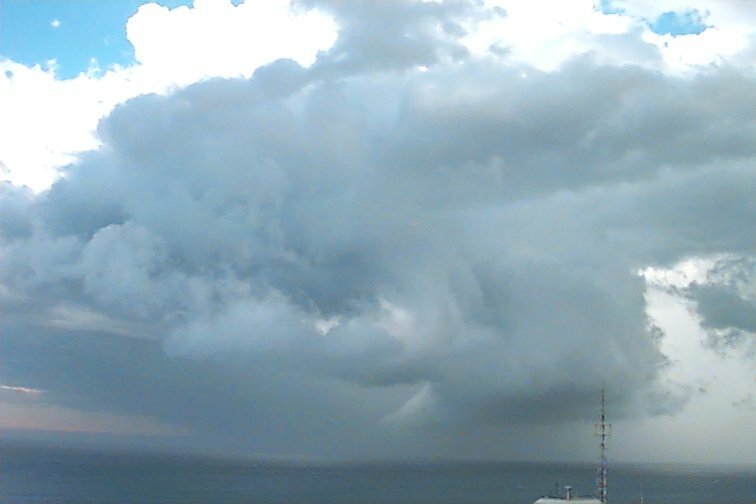 The second image shows the northern flank of the cells moving out to sea. What appeared to be a gust front on first impression was stationary, with the appearance being caused by the lifting of scud into the storms. 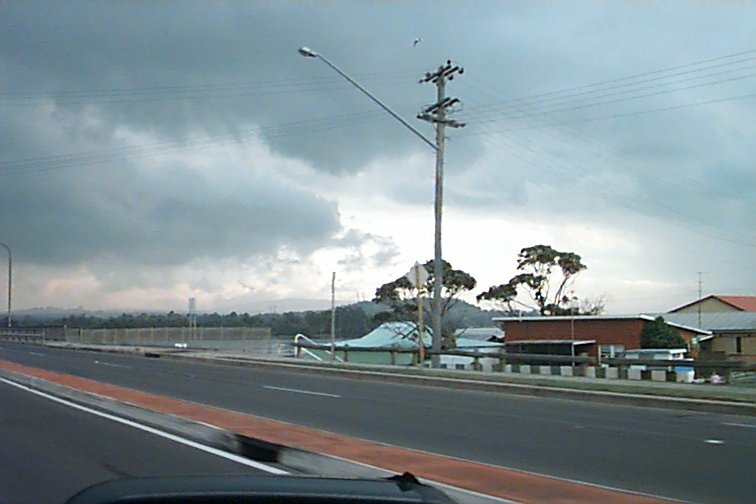 Both of these images were taken whilst driving over Windang Bridge. On arrival at Warilla beach, the rear of the storms had just passed out to sea, but the area just behind the last cell revealed a little more of what was going on. Inflow into a line of instability was occurring from both the NE and SW. Scud was clearly flowing from the south behind the line, which had me thinking of a southerly change again. 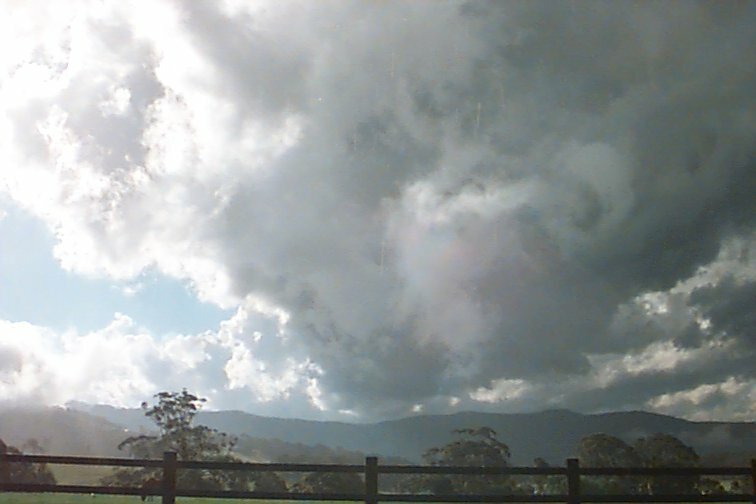 After taking a couple of photos on my 35mm, which will be posted later, it appeared that a new cell was crossing the escarpment just south of Dapto. I chased through Oak Flats and Albion Park, were rain was very close to torrential, before emerging into sunlight at Marshal Mount. Again the line of lifting was apparent. Looking NW there was plenty of cumulus, but it was not exploding like that just overhead. 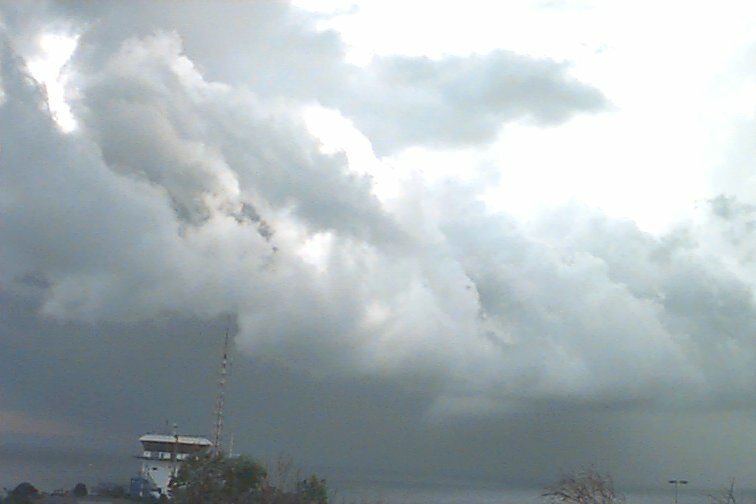 The image taken at 5:00pm shows the cumulus. Looking NE from here shows the low scud racing towards the line which was almost overhead, and the rear of the backbuilding and backsheared anvil. At the same time image 06 shows the scene to the SE, with cloud forming on the inflow from around 100m above the ground which flowed right up to the back of the cell. This cell was really moving, so I hotfooted it to Hill 60 to catch the sight of this storm moving out to sea. As I neared Hill 60, it looked like I would be looking almost directly side-on to the area northern side of the up-lift of cloud. As the scud moved to this line it was almost like it hit a wall and was lifted vertical to get over it. By this time it was around 5:30pm and the storm cells were well and truly out to sea. Anvil was spreading a little to the northern side of the line, but mostly heading SE. This image shows the scud being lifted on the tail-end of the cell. CG's were falling about every 10-15 seconds out to sea, which didn't seem to be happening over land. At last I decided that I had seen the best of it and got ready to head home for a run. Looking west at this time showed a layer of moisture trapped below the escarpment, and showing as low cloud. I took one more shot of the storm moving off which again shows the clear boundary of lift seen with earlier cells, which also shows the heavy rain falling with the storm. A very interesting day, with the movement of air-masses easily observed. Also, Wollongong was about the only area within NSW that benefited from the conditions that produced this storm. Apparently a capping effect limited the growth of cumulus in other areas, which moved in behind this system. 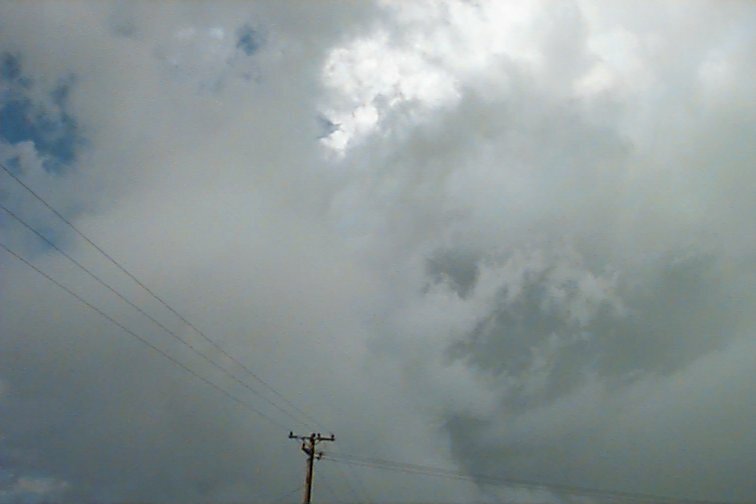 Eyewitness accounts of the earlier cells tell of a distinct green tinge to the clouds. Also the earlier cells were lightning active over land. At last, Wollongong had a day to make the rest of the state envious.